I was meeting with a friend recently and transferring some files onto their laptop when I realised I’ve been using USB Drives to do that for the last year. In fact I haven’t needed to burn any files to DVD ever since I got several USB Drives with 8Gb or more capacity. Basically cheap 8GB and larger USB Drives (costing $15+ at time of writing) have made data transfers via burnt 4.7GB DVD’s obsolete. 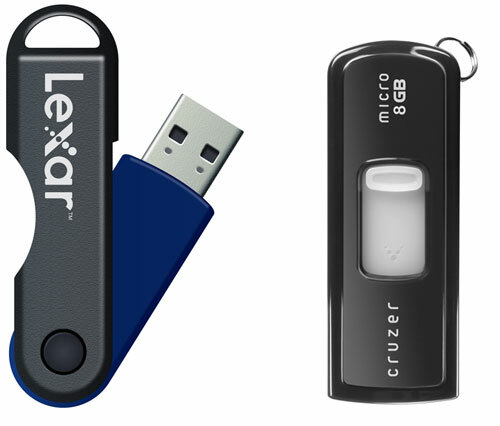 Many people own laptops or netbooks these days so if you need to give them some files at a meeting it’s much faster and easier to copy the files onto a fast USB drive than it was in the old days of finding a blank DVD and waiting while your computer burnt the files to it. On the more rare occasions when larger files need to be transferred eg: many videos or photographs, a portable USB hard drive is the best solution, far easier than burning dozens of DVD’s. Do you Agree or Disagree? Have cheap 8GB and bigger USB Drives made data transfers using burnt DVD’s obsolete? DVD is still useful for archiving data. Though my preference these days is to copy on to large USB hard drives instead. I’m still using an OLD usb drive from when they first came out! I only need it on occassion but the newer computers actually have trouble with it. If I could just remember to buy a new one when at the store. Nothing is safe from my view. Even a hard disk also gets corrupt and cause loss of data. There is a possibility of data recovery but that is not 100% sure and DVD’s are out dated version of storage media now. Only CDs I have are the ones that are really old or those which come with vendor products. It’s super easy. Open the folder to which windows movie maker saves files to…you can find this folder by opening windows movie maker and going to the properties or settings menu. Then open the folder that represents your drive……Click and drag! simple as that….